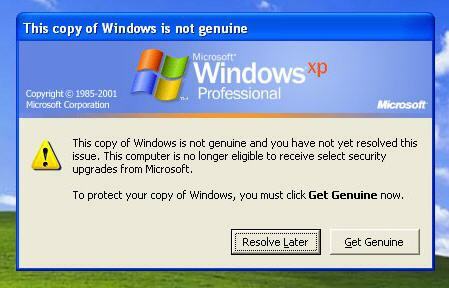 The Windows Genuine Advantage Notifications tool repeatedly nags computers that use pirated copies Windows XP. Windows Validation is required for all genuine Windows downloads on Microsoft Download Center. The anti-piracy tool attempts to contact Microsoft over the internet each time the computer boots. The connections occur even if you do not have Windows Automatic Update enabled. Lauren Weinstein is of the opinion that Microsoft Genuine Advantage tool may itself be considered to be spyware under commonly accepted definitions. I fail to see where Microsoft has a "need to know" for this data after a system's validity has already been established, and there may clearly be organizations with security concerns regarding the communication of boot-time information. » Microsoft receives user IP address and date/timestamp data relating to systems' booting and continued operations, which MS would not necessarily otherwise be receiving. » Even after a copy of XP has been validated, MS may choose to "revoke" that validation (via communications with their Windows Update site) at a later date if activation codes are found to be pirated in the future. » Why is the new version of the validity tool trying to communicate with MS at every boot? At this time the connections are to provide an emergency "escape" mechanism to allow MS to disable the validation tool if it were to malfunction. Apparently these transactions will also occur once a day if systems are kept booted. The validation checks can be disabled by either blocking the WGA tool from communicating with Microsoft using ZoneAlarm or disable the WGATray.exe process. Once you suppress the WGA notifications, it is possible that the notifications will be re-activated when a new update for WGA Notifications is installed.